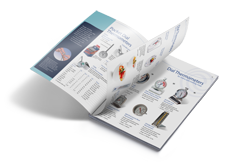 As a general rule, temperature measurement devices should be regularly calibrated in order to prove their accuracy. This guide to Field Calibration will assist you in the calibration of your device. 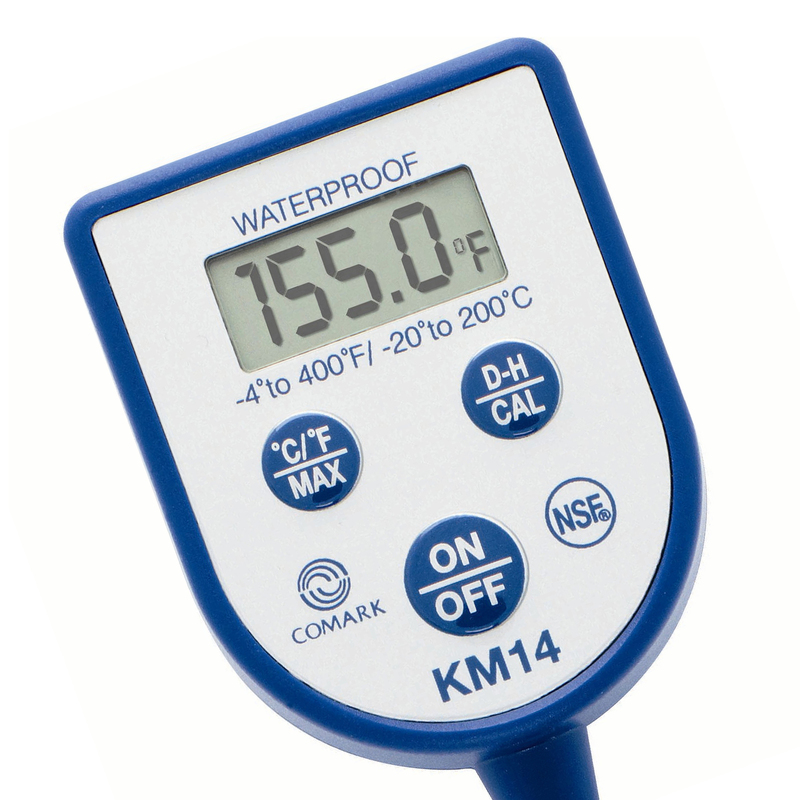 Comark has a number of Pocket Digital and Pocket Dial Thermometers that can be calibrated to ensure accurate temperature readings. The goal of the calibration is to verify that the displayed reading you are getting is an accurate one and for such devices a simple crushed ice solution can be used, to calibrate the thermometer to zero degrees Celsius, or 32 degrees Fahrenheit. 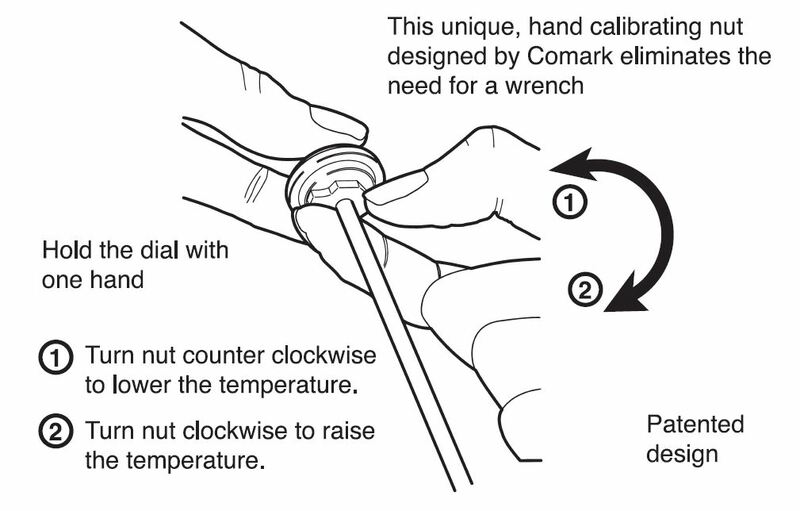 For detailed instructions on the field calibration of your Comark Pocket Dial Thermometer, please select this option. For detailed instructions on the field calibration of your Comark Pocket Digital Thermometer, please select this option. For detailed instructions on how to create a crushed ice solution in order to calibrate your Comark Pocket Digital Thermometer, please select this option. To re-calibrate to within ± 1 division, immerse the stem at least 3″ into a slush ice solution (60% crushed ice and 40% tap water). Wait at least one minute for the sensor to reach equilibrium. 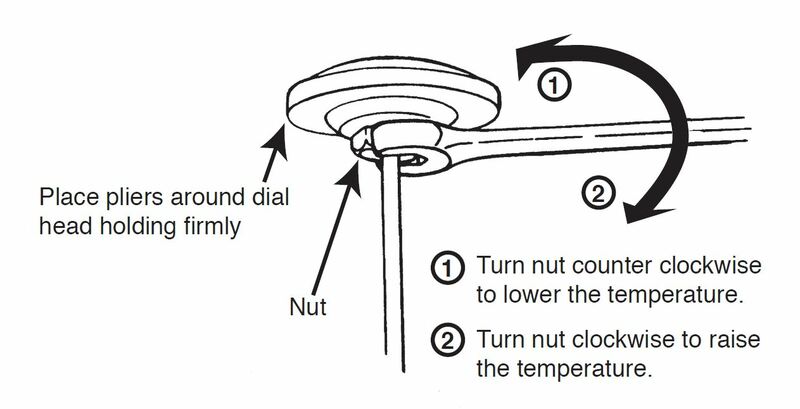 By holding the unique, hand calibrating nut in one hand, the Thermometer can be adjusted until the pointer reads 32°F, as shown below. To re-calibrate to within ± 1 division, immerse the stem at least 7.5cm / 3″ into a slush ice solution (60% crushed ice and 40% tap water). Wait at least one minute for the sensor to reach equilibrium. By holding the hex nut securely with a wrench or pliers, the Thermometer can be adjusted until the pointer reads the desired temperature. 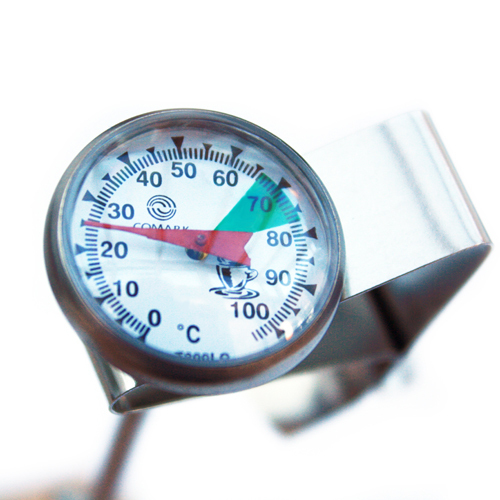 You will need a second Thermometer, either glass or digital, to verify the control temperature. Most Comark Digital Thermometers can be Field Calibrated using the simple steps outlined below. We would also encourage you to watch the ‘Slush Ice Thermometer Calibration’ Video above if this is your first time re-calibrating your device, or in case you need a quick visual reminder. Put some water and crushed ice into a clean mug or water bath (approx 60% crushed ice to 40% water). Insert the thermometer into the ice solution until the stem is covered to at least half way along its length. Wait for the reading to settle. Press and hold the D-H button for 8 seconds to begin calibration. “CAL” will be displayed on the LCD screen and calibration at 0°C will be complete. 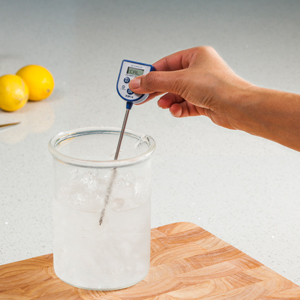 A simple crushed ice solution can be used, to calibrate your thermometer to zero degrees Celsius, or 32 degrees Fahrenheit. A crushed ice solution typically contains approximately 60% crushed ice to 40% water. We would encourage you to watch the ‘Slush Ice Thermometer Calibration’ video above, for additional guidance. First, you will need a suitable container A 250 millilitre, or eight ounce container, would be ideal. Next you will need to crush enough ice to fill the container. Don’t be tempted to use un-crushed ice, such as standard ice cubes. Once the container is full, pour in cold water until the surface starts to turn from ice white to slightly grey in colour. 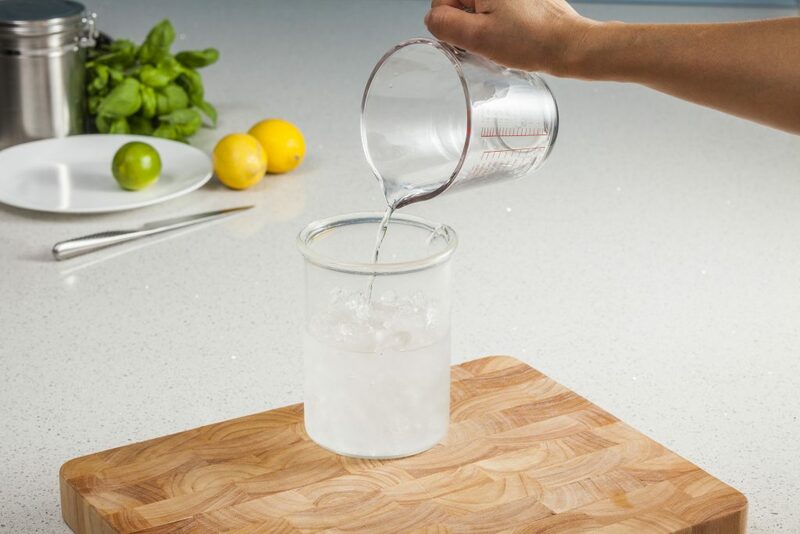 The ice on the surface should show just a small amount of water and not an excessive amount, so push down firmly on the ice and pour off any excess. Essentially the ice should still be allowed to float. Your Ice Point is now ready for use and can be topped up as necessary, depending on how long it’s needed. Simply add more ice but remember to drain any excess water. To start the calibration check, simply immerse the probe of your thermometer into the solution, so that it is at least 2.5 centimetres, or 1 inch, below the level of the water in the crushed ice solution. You should not allow the probe tip to rest on the bottom or the sides of the container. Now you need to wait for the reading on your thermometer, to become stable. We would normally expect a reading to show, that is within 1 degree of zero degrees Celsius, or within 2 degrees of 32 degrees Fahrenheit.